Moroccan spiced pumpkin, silverbeat, chickpea & almond; red cabbage ‘slaw with walnuts/pomegranate dressing; roast beetroot, broccoli, orange, split pea + feta. Being in New Zealand in the summer (in January!) meant that salads were an integral part of mealtimes. And that’s hard to let go. Since we arrived home, there’s been a rotation of big plate salads on the table – wholegrains like barley, brown rice, quinoa and buckwheat combined with lentils and chickpeas, roast vegetables and citrus fruit have all brought a splash of colour to the plate as we readjusted to normal Irish spring weather. Buckwheat is one of the wholegrains that’s part of the regular rotation. Well, for the adults at the cottage at least; sometimes the smallies decide that its distinctive earthy flavour is a little too much to deal with, which is easily solved by mixing it with barley or brown rice (just don’t get caught!). At the moment I have three kinds of buckwheat in the pantry; buckwheat flour (great for savoury pancakes and the girls don’t complain about those), plain buckwheat groats and roasted buckwheat groats, also known as kasha. In this salad I’ve been using the roasted buckwheat but feel free to substitute the plain groats if that’s all you can find. Both plain groats and kasha are fairly easy to track down in health food shops, Polish shops or supermarkets. Blood oranges were something (the one thing!) that New Zealand didn’t have while we were there. I buy kilos every spring and – as well as eating bowls of them – like to play with the distinctive citrus-raspberry blood orange flavours in cooking. Use the juice in homemade mayonnaise to drizzle over fresh, crunchy scorzonera with salad leaves and toasted hazelnuts, toss segments through a roast squash and bulgar salad and roast slices with vegetables or, as below, chickpeas. Got to bring some sunshine to the table. You can have fun playing around with spices here. The comfort of cumin with a chilli spike is what I need on dull days, spice blends like ras al hanout or garam masala also work well. Chives are the only herb growing in the garden at the moment but I’d love to try mint in this recipe. Serves 4-6 as a side salad. Rinse and drain the chickpeas in a strainer under cold running water. Dry well, using a clean tea towel or paper towels, and toss, in a large bowl, with the cumin, chilli flakes, a good pinch of sea salt and the olive oil. Spread out on a large baking tray and roast in the oven. Meanwhile, cut the blood oranges in half and thinly slice them. After the chickpeas have been in the oven for 10 minutes, toss them with the blood oranges slices and return to the oven for another 10 minutes. Bring 250ml water to a boil, stir in the buckwheat and turn the heat to low. Cover and cook for 6-8 minutes, until tender. Set aside for a few minutes with the lid on, then leave to cool. Using a julienne peeler – or your superb knife skills – cut the carrots into julienne strips. To make the dressing, whisk the olive oil, pomegranate molasses and lime juice together with a pinch of sea sat and freshly ground black pepper. Now, assemble! Toss the buckwheat with half the dressing and spread it across a large platter. 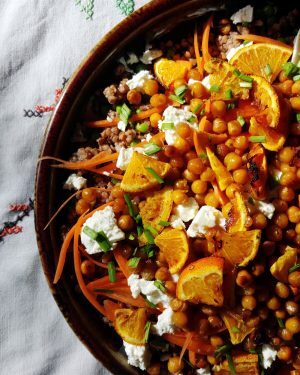 Scatter with the roasted chickpeas and blood oranges, the crumbled feta and chopped chives. Drizzle with the rest of the dressing and serve. What’s in your lunchbox? Pumpkin and feta tortilla!